November 2-4th saw the 50th conference of the American Wine Society in Kalahari Resort of the Poconos, PA. Seminar highlights for me included: Annette Schiller’s presentations on Alsace and Burgundy, accompanied by brilliant wines, as well as Paul Wagner’s fascinating and informative presentation on the Grands Cru Premier wines of Bordeaux, also with brilliant examples to taste. I presented “The Best Wines of New England” based on competition results from this year’s first Best of New England Wine Competition (which I organized), and “Petit Manseng, an Obscure Vinifera Game-Changer for Virginia”. The first featured the Best White (Shelburne Vineyards of VT’s 2015 La Crescent), Best Mead (Hermit Woods of NH’s Three Honey Gold) and Best Specialty wine, “Forest Gold” maple wine from Aaronap in western MA. 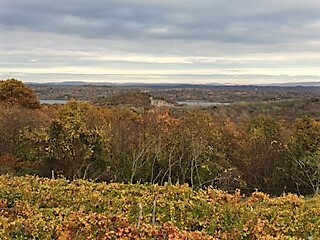 For the Petit Manseng presentation, the two dry wines (both with 15-20% other grapes blended) were Lovingston Vineyard and Michael Shaps Winery, both 2015 varietally labeled, with Grace Estate’s “Adeliza”, semi-sweet aperitif style (16.4%) petit manseng aged in 30 year old cognac barrels. The dessert example was the Stinson Vineyard 2015 late harvest petit manseng. Both presentations had 65-70 attendees, and I was pleased to learn that for almost everyone, this session was their first choice and not where they had to go since they had no other choice. I also poured Virginia wine for the Wine Walk-Around on Friday night with other AWS volunteers and it was a treat since all 24 wines came from the Governor’s Case winners the last couple of years. **Vidal 2016: Nose: racy, cool climate aromas of lime and mineral. Palate: riesling-like, fine fruit/acid balance, racy brilliance, green apple fruit, long finish. For varietal vidal, it’s world-class; a shame so many “grape racists” won’t give hybrids a chance, but this won top honors in the last Hudson Valley wine competition. *Reserve Riesling 2015: Nose: much like the Vidal’s but with white peach too. On the palate, more peach, bright acid and red apple/peach; really nice! Drinks in the Finger Lakes style and shows more riesling should be planted in the HRV. Not yet fading after two years. Riesling 2015 (off-dry): Nose: more forward, complex apple cantaloupe, peach notes. Palate: juicy, lots of ripe peach, some sweetness but enough acid to balance. Gewurztraminer 2016: Nose: delicate but classic rose petal, lychee. Palate: same delicate fruit but nicely dry, w. hint of bitterness, fresh acidity. Cabernet Franc 2015: Nose: smoky red cherry and clean earth. Palate: red cherry, med. Tannins, crisp finish, good reflection of the terroir. *Sky Island 2014: A blend of the five red Bordeaux grapes. Nose: bright black fruits, some smoky oak but fruit-forward. Palate: smooth ripe tannins and ripe black fruits in elegant balance, zesty, stylish. Cassis: a local specialty. Nose: ripe red fruit and clean earth. Palate: medium-sweet, well-balanced with acidity, dark chocolate hints; easy to like and not too dry or bitter. 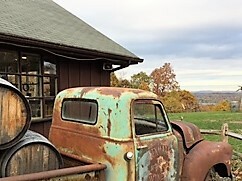 The next stop was Hudson Chatham Vineyards in the upper Hudson Valley near Ghent, owned by wine blogger Carlo DeVito. He grows only hybrids at his cool location, and does a fine job of it. 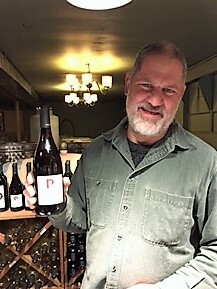 In particular I like his pinot noir-like subtlety and delicacy of his chelois and leon millot, two obscure French red hybrids that are great if you appreciate pinot noir, cabernet franc, corvina and other light cool climate red grapes. 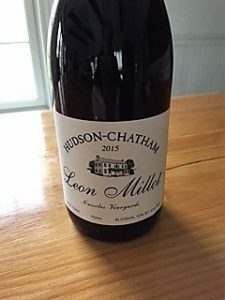 Carlo pulled a library bottle from his cellar, which was a 2012 Leon Millot, a warm vintage, but the wine was lovely, with a bouquet of red fruits and rose, firm grip, moderate tannins, and flavors of strawberry. For a red hybrid, holding up very nicely after five years. I liked his 2015 Chelois almost as well. A typically subtle but fresh nose revealed wild strawberries! The wine needed a few minutes to open, but came to resemble a gamay, with dark bass notes of clean earth and black fruits added to the bright red berries on the nose. Firm acid, moderate/low tannins, but an excellent food wine one could enjoy any time of year (good Thanksgiving candidate). Hudson Chatham’s most original wines come from Carlo’s work writing about whiskey and bourbon (The New Single Malt Whiskey which he edited has gotten much praise). He took two styles of sherry (labeled as “fino dessert wine” since American producers can’t label their wines with classic regional names like port or sherry unless they’ve been grandfathered in). 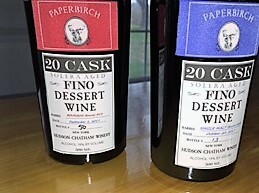 The winery has a line of small-lot, high quality fortified wines called “Paperbirch”. Both sherries are processed in a 20-cask traditional solera system. The drier of the two labels (purple color), after blended from the solera, was then aged in a single malt whiskey barrel, labeled with the bottle number and date of bottling. This one was a dark color, with a pungency like oloroso sherry and a rich texture with a big dimension on the palate, complemented well by the malt whiskey. The sweeter of the two (red label) had the same processing but in a used bourbon barrel. A nose of fino sherry was followed by a mellow off-dry mid-palate, not too sweet but again, a complementary and original enhancement to traditional fino dry sherry. The next day I drove to Meredith, NH on Lake Winnipesauke, where it was a surreal 61 degrees on Nov. 7th. At Hermit Woods Winery, I enjoyed tasting many fine wines, none made from grapes; they use local and New England berries, apples, and honey to make first-class dry fruit wines, cider, mead and an exquisite blueberry port (full disclosure: I organize the Best of New England Wine Competition with Hermit Woods Winery, who have no influence in the judging. Accordingly I won’t review their wines to avoid a conflict of interest). In the current issue of Food & Wine, editor Ray Isle chose a single craft beverage from each of the 50 states. 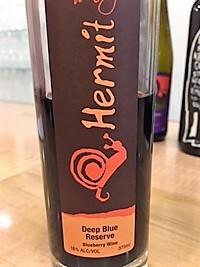 The only New England state represented by a wine, instead of beer, was Hermit Woods, which he chose on the basis of tasting their Petite Blue Reserve, an fine, dry blueberry wine. Benmarl’s iconic delivery truck from the 1950s. Nose: white flowers, white peach, yellow apple. Palate: full-bodied, juicy ripe peach and apple mid-palate, off-dry, vibrant fruit. 0.2% residual sugar. Nose: fragrant black fruits, fruit-forward, smooth oak and nice bright acid on the finish; very stylish. (blend of Long Island and Finger Lakes fruit: 50% cabernet sauvignon, 30% merlot, 20% cabernet franc; in French oak for 20 months). Nose: cassis, forward with darker merlot and cabernet franc in the background; nice start. Palate: big cassis fruit-driven flavors, large volume and palate depth, ripe firm tannins, with oak notes on the finish. Stylish, young; will improve 4+ years. Nose: deep blackberry with some clean earth, like a Dolcetto d’Alba. Palate: smooth, some white pepper, black plum, round texture, clean fresh finish. Distinctive and elegant. This is one of the best examples of varietal traminette I’ve tasted. This Geneva, NY (Cornell) hybrid comes from two parents, one of which is gewürztraminer, the other a Seyve white hybrid. Nose: classic gewürztraminer character: ripe, rich, floral and spicy. Palate: perfumed, with roses and lychee but excellent fruit/acid balance. Technically off-dry but traminette has much better acidity than gewürztraminer so it drinks almost dry. I was a big fan of this pinot based on the 2007 vintage when I compared it to Chambolle Musigny, and I’m pleased to see that it’s performing on the same level in the same way, and is on a par with the best East Coast pinots. Nose: classic Burgundian style: bright red cherry and clean forest floor. Palate: young but balanced and classic with firm acidity to balance delicate fruit, will age at least another three years. Nose: bright blackberry. Palate: juicy, dry, fruity, nice dark chocolate notes on the finish. Fun, gluggable though dry, and a fine representation of the grape and the Lehigh Valley which has a Chambourcin Trail, all members featuring a chambourcin (or more) in their tasting rooms. Nose: light vanilla hints, bright red fruits. Palate: great finesse and integration of red fruits, sort of flint or gun metal on the finish with a Finger Lakes liveliness. * Veritas 2015 (40% each cabernet sauvignon and merlot, 10% each cabernet franc and petit verdot).Nose: lighty, creamy vanilla and red fruits. Palate: lively and smooth, bright red cassis dominates then chewy ripe tannins, lively fresh finish. Young, stylish, needs time.